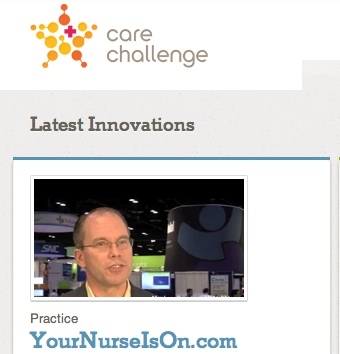 YourNurseIsOn.com Innovative Healthcare Communications Platform Accepted to Sanofi Aventis' CareChallenge! Please Vote! Wow! After being rejected by Sanofi Aventis' #CareChallenge for the audacious claim that proper staffing "saves lives", Your Nurse Is On has finally been 'accepted' as an industry changing innovation for their global competition! We are honored, pleased and delighted to be amongst such innovative solutions trying to improve our healthcare systems, worldwide! Of course, by now, everyone from HCA, Kaiser and The Veteran's Administration knows that they never have to call their staff one-by-one to cover 'callouts', changes in acuity or census, or to cover vacation, sick time or maternity leave. We are excited to be recognized by such a global healthcare leader as a paradigm changing healthcare technology solution and look forward to spreading the word across the globe! Please help us by visiting this link YNIO at CareChallenge and voting for us- It only requires a moment of your time and YOU can help improve healthcare for all! Please share this link with your friends, followers and readers! If you would like to know more about YNIO, please take a look at this 90 second video from HIMSS 11 YourNurseIsOn at HIMSS to learn more. I would cherish you as a 'follower' on Twitter @MatthewBrowning & @YourNurseIsOn. If you would like to schedule an online demo of YourNurseIsOn.com please email me, Matthew Browning MSN, RN, CEO at mbrowning@yournurseison.com and I will personally show you how to save time, money and, yes, even lives by instantly allocating your healthcare providers where YOU need them, when needed, by two-way phone, text and email. Thank you and here's to you health!